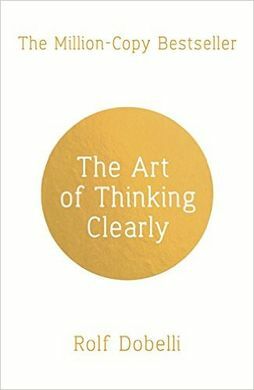 The Art of Thinking Clearly by Rolf Dobelli is a collection of very short essays exploring the many mistakes humans are prone to making when we think about things. There’s not much new in this book, but I find however often I read about confirmation bias and the sunk cost fallacy I find myself slipping back into that kind of thinking. It’s hard work because our brains aren’t actually wired for logic and rational thinking. This is an easy and accessible guide to some of the concepts that can be found in much denser books like Thinking Fast and Slow by Daniel Kahneman. There are 99 thinking errors in this book which address things like how the availability of examples makes us forget about probability and how we regularly mistake correlation for causation. If you want to understand why people sometimes say and do things that you think are ridiculous, then this book will help. Although it might also make you realise that the things you say and do are also ridiculous. so be warned.